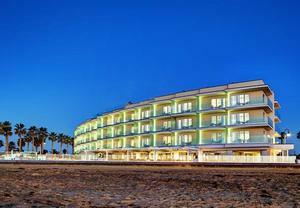 IMPERIAL BEACH, CA—(Marketwired – Dec 19, 2014) – Pier South Resort is set to light up Imperial Beach with a New Year's Eve Bash that promises to tempt and tantalize. Guests are invited to reserve their spot at this exclusive party which includes a four–course dinner at SEA180 Coastal Tavern, the resort's popular waterfront dining hotspot, a champagne toast, live entertainment and dancing as guests count down to the New Year. Tickets for the event are $100 per person. Guests can make it a staycation by booking a room at the resort and waking up in a luxury beachfront suite, ready to greet 2015. For $299, guests can receive two tickets to the party, along with an overnight stay in a luxury King Suite. For $399, guests will enjoy a four–course dinner for two at SEA180, plus two tickets to the party, and an overnight stay in a luxury King Suite. The New Year's Eve Bash kicks off in style at 9:00 PM with a live band and DJ, dance floor, and open bar, while guests take in glorious beachfront views. It all culminates in a champagne toast at midnight as everyone greets the New Year — then the party continues until 1:30 AM. SEA180's four–course dinner starts with a choice of gem salad, miso marinated salmon, or spiced carrot bisque, followed by a second course of roasted red pepper and faro risotto. The third course offers a choice of whole local fish, islander IPA braised short ribs, salmon “Oscar,” rosemary pork prime rib, macadamia–pepita crusted lamb lollipops, dried chill rubbed New York steak, or pollo cordon azul. Finally, guests are invited to finish off their meal with a choice of rumbaba, tres leches cake, or chocolate devil's food cake. For reservations, guests can call 619–621–5900 or reserve their hotel package online at www.piersouthresort.com. Pier South Resort is classic Southern California. The modern beach resort hosts 78 perfectly appointed guest rooms, each with a spacious 650 square feet, separate living areas and bedroom layouts. Private balconies afford 180 degree shoreline views, while bicycles, kayaks, paddleboards and boogie board rentals invite guests to dive right into the Southern California lifestyle. The adventurous can also sign up for surf lessons while enjoying San Diego's 267 days of yearly sunshine. The resort's full–service Dames Spa provides endless pampering, and the sparkling heated pool and cabana chaise lounges offer a relaxing respite. Foodies will enjoy the hotel's hottest culinary destination, SEA 180, a coastal tavern at Pier South, led by the locally celebrated Cohn Restaurant Group and Executive Chef, Ken Irvine. Best of all, the resort is Silver LEED Certified, outfitted with solar heating/cooling and efficient water conservation features. MT. ARLINGTON, NJ—(Marketwired – Dec 19, 2014) – With the completion of new renovations at the Courtyard Rockaway–Mt. Arlington hotel in NJ, the property is set to become a go–to destination for meetings and events. The new private venue offers 960 square feet of flexible event space to accommodate functions of varying sizes, with unique catering options designed to impress clients, colleagues and friends alike. The new catering offers are designed to meet each event's specific needs, from breakfast to coffee breaks, lunch, snack breaks, dinner, and evening receptions, as well as brunches, rehearsal dinners, cocktail receptions, or late–night after parties. Both buffet and covered dish service is available, along with passed hors d'oeuvres, and our talented team of culinary artists can accommodate groups of all sizes, up to 60 people. Each menu can be customized to fit your budget, as well as any dietary restrictions that might be necessary. The hotel can also host larger groups outdoors on its spacious grounds, with off–site catering available for all types of events of different sizes, including groups ranging from 25 to 600 attendees. The team is able to handle any function, from informal house parties to elegant weddings and corporate parties with ease. To usher in these fresh beginnings, the hotel welcomes its new Food & Beverage Manager with the experience and expertise to ensure that each event is handled with excellence. The new manager has owned and operated three restaurants and one major catering company, bringing along more than 25 years of experience in the culinary industry. The manager has cooked for numerous celebrities, including James Brown, Tom Jones, Buddy Guy, Julio Iglesias, John Leguizamo, Dickey Betts, Joan Rivers, Don Rickles and many more, and has catered for Fortune 500 companies including Polo–Ralph Lauren, Tiffany's, Champion Mortgage, and numerous financial services and medical sales firms. For more information about renovations to the meeting space and catering options at the newly expanded Courtyard Rockaway–Mt.Arlington, visit the hotel website. Offering guests 125 recently renovated guest rooms and suites, the Courtyard Rockaway–Mt. Arlington is a comfortable and chic destination for travelers of every sort. Business guests can take advantage of the hotel's close proximity to businesses like MARS and Siemens, as well as its 24–hour business center and 960–square–foot meeting room. Leisure travelers, meanwhile, can relax at the indoor pool or work out in the exercise room before exploring nearby attractions. The Bistro energizes everyone with Starbucks specialty beverages and healthy menu options. And the guest rooms ensure superior comfort with soft beds, complimentary Internet access and features like coffeemakers, microwaves and refrigerators. With its updated aesthetic and practical amenities, this is one hotel that makes any trip feel like a true vacation. DORVAL, QC—(Marketwired – Dec 19, 2014) – Visitors arriving at the Montreal Airport Marriott In–Terminal Hotel will marvel at its design, which is as sleekly beautiful as the jets flying overhead. They will enjoy the convenience of its location within the Montreal Trudeau Airport. And now, with the arrival of Chef Legris at the hotel's Bijou Resto | Bar, they will savour every minute of their stay, whether they're dining on Breton crêpes in the morning, or feasting on a festive dinner on New Year's Eve. Chef Legris arrived at this Montreal airport restaurant after spending more than 20 years in illustrious kitchens around Canada. While destinations like Restaurant Laloux and Express in Montreal appear on Chef Legris' resume, it was his time at C Restaurant with Chef Robert Clark that helped him hone his passion for honouring the integrity of his ingredients even as he transforms them into something deliciously innovative. 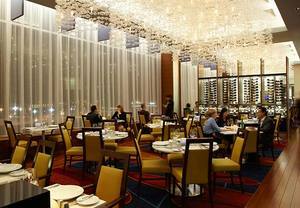 Today, guests of the Bijou restaurant in Montreal can taste that passion for themselves. Chef Legris prides himself on infusing each dish with excitement. Yet practicality also appears in the all–important inventory of ingredients: Chef Legris makes a point of using as much fresh produce from local suppliers as possible. This approach resonates with Bijou, which has earned a reputation as one of Montreal's best restaurants largely thanks to its emphasis on fresh, local and creative cuisine. Organic produce and sustainable, natural meats get transformed into salads, steaks, sandwiches and entreés like halibut served with celery root and apple pureé or a half–roasted Cornish hen served with wild mushrooms and grape confit. And no matter what's on the plate, guests can look forward to savouring it within a stylish, modern dining room outfitted with hardwood floors and elegantly contemporary light fixtures. While this Dorval restaurant serves three meals a day, as well as a convenient 5–10–20–Minute menu at the bar, guests looking for an unforgettable taste of Chef Legris' culinary prowess should book a reservation for New Year's Eve. For just $55 per person (excluding tax and gratuities), celebrants will indulge in a lavish buffet dinner between 6 and 10:30 p.m. Between the bites, the ambience and the evening's four–hour complimentary parking, the event promises to ring in the New Year with plenty of good taste. To make reservations for the New Year's Eve event, patrons can call 1–514–828–5117. Located directly inside Montreal's Trudeau Airport, the Montreal Airport Marriott In–Terminal Hotel offers an ideal location for travellers who are flying in or out of Montreal. This AAA 4–Diamond hotel and TripAdvisor's Certificate of Excellence winner offers complimentary wireless Internet access throughout public areas, a lively restaurant, business centre, fitness centre, indoor pool, laundry service and valet parking. The 272 guest rooms and seven upscale suites feature comfortable beds with down duvets and fluffy pillows, floor–to–ceiling windows as well as 32–inch, flat–screen TVs and free movie channels. Enjoy a fine meal made with farm–fresh, local ingredients at Bijou Resto | Bar, or unwind with a relaxing treatment at the AltiSpa. With 20 meeting rooms and more than 14,000 square feet of function space, the hotel is the ideal venue for events in the Montreal area. The hotel is also just a quick drive from downtown Montreal's great restaurants, shops and attractions, like Cap Saint–Jacques Park, Pointe Claire Village, the Morgan Arboretum and the charming historic district of Old Montreal. VANCOUVER, BRITISH COLUMBIA—(Marketwired – Dec 19, 2014) – Imperial Metals Corporation (“Imperial”) (TSX:III) announces it has completed and closed the sale of the 93 kilometre 287kV Iskut extension of the Northwest Transmission Line to BC Hydro for $52 million. The Iskut extension was built by Highway 37 Power Corp., a subsidiary of Imperial, from the terminus of the Northwest Transmission Line at the Bob Quinn substation to a newly constructed substation at Tatogga Lake. A 16 kilometre 287kV power line connects the Red Chris mine to the Tatogga substation. Power was first delivered to the Red Chris mine via the Iskut extension on November 7, 2014. To date the substation and main transformer, pit, crusher, overland conveyors, reclaim water systems and the main switchgear in the mill building have been electrified and are now available for service. Mining is underway on both the East and Main zones and the operations personnel have begun crushing and conveying ore to the coarse ore stockpile in preparation for commissioning the mill. As part of the mine commissioning process, an ore stockpile near the gyratory crusher has been established in preparation for commencing mill operations in the coming weeks. Imperial is pleased to have designed and built the Iskut extension, a key component of the electrification of BC's northwest. The Iskut extension, along with the Northwest Transmission Line, will provide grid power to the newly constructed Red Chris mine and future developments along the 437 kilometre transmission line corridor from Terrace to Tatogga Lake. “We are very pleased to have been able to work together with the provincial government and the Tahltan nation and be part of the planning and construction of this important new regional development initiative. This will provide the power infrastructure for developments, such as the Red Chris mine, that will provide for long term employment and economic growth in the region,” stated Brian Kynoch, President of Imperial. Imperial is an exploration, mine development and operating company based in Vancouver, British Columbia. The Company operates the Mount Polley copper/gold mine in British Columbia and the Sterling gold mine in Nevada. Imperial has a 50% interest in the Huckleberry copper mine and a 50% interest in the Ruddock Creek lead/zinc property, both in British Columbia. Imperial is in development of its wholly owned Red Chris copper/gold property in British Columbia. This news release contains statements which constitute, or may be deemed to constitute, “forward–looking information” which are prospective in nature and reflect the current views and/or expectations of Imperial. Often, but not always, forward–looking information can be identified by the use of statements such as “plans”, “expects” or “does not expect”, “is expected”, “scheduled”, “estimates”, “forecasts”, “projects”, “intends”, “anticipates” or “does not anticipate”, or “believes”, or variations of such words and phrases or statements that certain actions, events or results “may”, “could”, “should”, “would”, “might” or “will” be taken, occur or be achieved. Such information in this press release includes, without limitation, statements regarding Imperial's expectations relating to the commencement of mill operations at the Red Chris mine, and expectations relating to the impact of the Northwest Transmission Line on Imperial's business and the region. Forward–looking information is not based on historical facts, but rather on then current expectations, beliefs, assumptions, estimates and forecasts about the business and the industry and markets in which Imperial operates, including assumptions that there will be no material delay in the commissioning and commencement of mill operations at the Red Chris mine, that equipment will operate as expected and power ramp up will proceed as expected, and that there will be no material obstructions or impacts curtailing expected outcomes in the region. Such statements are qualified in their entirety by the inherent risks and uncertainties surrounding future expectations. Forward–looking information involves known and unknown risks, uncertainties and other factors which may cause Imperial's actual results, revenues, performance or achievements to be materially different from any future results, performance or achievements expressed or implied by the statements constituting forward–looking information. Important risks that could cause Imperial's actual results, revenues, performance or achievements to differ materially from Imperial's expectations include, among other things: risks of business activity delays or interruption due to protest and civil disobedience, equipment failure, labour unrest, power shortages, risks related to timing of the commissioning and commencement of mill operations at the Red Chris mine, and other hazards and risks found in Imperial's Management's Discussion and Analysis for the year ended December 31, 2013 and other public filings which are available on Imperial's profile on SEDAR at www.sedar.com. For the reasons set forth above, investors should not place undue reliance on forward–looking statements. Imperial does not undertake to update any forward looking information, except in accordance with applicable securities laws. PORTLAND, OR—(Marketwired – Dec 19, 2014) – The board of directors for Northwest Natural Gas Company, dba NW Natural (NYSE: NWN), has approved several executive promotions including MardiLyn Saathoff to senior vice president and general counsel; Shawn Filippi to vice president and corporate secretary; and Kim Heiting to vice president of communications and chief marketing officer. All three promotions are part of the company's long–term succession planning efforts and will take effect January 1, 2015. Saathoff will assume the general counsel functions currently performed by Margaret Kirkpatrick who will move into the role of senior vice president of environmental policy until her planned retirement at the end of 2015. Saathoff will report to Gregg Kantor, President and CEO. Saathoff is currently vice president of legal, risk and compliance and also serves as chief governance officer and corporate secretary. Prior to NW Natural, Saathoff worked for Danaher Corporation, Tektronix, Inc., the Oregon Governor's office, the Oregon Department of Justice, and Stoel Rives, LLP. Saathoff serves on the board of directors for Oregon Health Sciences University, Portland Center Stage and the Northwest Gas Association. She holds a master's degree from Lewis & Clark and a JD from Lewis & Clark Law School. Shawn Filippi is being promoted to vice president and corporate secretary, reporting to Saathoff. Filippi has been with NW Natural for nearly 10 years, with her most current position as the company's senior legal counsel and assistant corporate secretary. Previously, Filippi was an attorney at Stoel Rives, LLP, where she practiced in the areas of corporate law, securities, finance and mergers and acquisitions. A graduate of Lewis & Clark Law School, Filippi served as a trustee and chair of the alumni board of directors for the Northwestern School of Law. She has also served as a trustee for the Oregon chapter of the National Multiple Sclerosis Society. Kim Heiting is being promoted to vice president of communications and chief marketing officer, reporting to David Anderson, executive vice president and chief operating officer. Heiting joined the Company in 1998 and has served in a variety of roles during that time, including corporate communications director and chief communications officer. Prior, Heiting held management positions at Bank of America Corporation and Alltel Corporation in Chicago, IL. She has a master's degree from Northwestern University, and currently serves on the board of LifeWorks Northwest and the Northwest Gas Association. NW Natural (NYSE: NWN) is headquartered in Portland, Ore., and provides natural gas service to about 700,000 residential, commercial and industrial customers in Oregon and Southwest Washington. It is the largest independent natural gas utility in the Pacific Northwest. Additional information is available at nwnatural.com. LOS ANGELES, CA—(Marketwired – Dec 19, 2014) – Levine Leichtman Capital Partners (“LLCP”), a private equity firm headquartered in Los Angeles, California, has announced a completed recapitalization for Global Franchise Group, LLC (“GFG”), a portfolio company of Levine Leichtman Capital Partners IV, L.P.
“We are pleased to have completed this divided recapitalization for GFG, which provided working capital and paid a shareholder dividend,” said Arthur Levine, president of Levine Leichtman Capital Partners. Recapitalization by private equity groups such as LLCP is a common practice. Investments by LLCP bring financial and operational experience to business partners, while at the same time, allow the owners of the business to maintain meaningful equity stakes in their companies. Since 1984, Levine Leichtman Capital Partners has provided entrepreneurs with long–term capital and financial expertise. LLCP makes investments into middle market companies utilizing its structured equity investments approach. Previous investments include Santa Cruz Nutritionals, CiCi's Pizza, Hackney Ladish, and Luminator Technology Group. As a strategic brand management company with a focus on franchising, Global Franchise Group, LLC owns a portfolio of franchise brands that includes multiple quick service restaurant (QSR) franchise concepts. The company has a solid reputation for the support it provides to nearly 1,100 franchised and corporate stores in over 16 countries across the globe. The GFG recapitalization is one of many recent successful transactions that LLCP has handled. The senior credit facility was provided by Ares Capital Corporation, Bank of Montreal and NXT Capital. For more information, visit the Levine Leichtman Capital Partners website at http://www.llcp.com . Levine Leichtman Capital Partners is a Los Angeles, California–based investment firm that manages approximately $7.0 billion of institutional investment capital through private equity partnerships, and various debt and leveraged loan funds. LLCP is currently making new investments through Levine Leichtman Capital Partners V, L.P., Levine Leichtman Capital Partners SBIC Fund, L.P., and Levine Leichtman Capital Partners Private Capital Solutions, L.P.
NEW YORK, NY—(Marketwired – Dec 19, 2014) – The Boards of Trustees/Directors of the PIMCO closed–end funds (each, a 'Fund” and, collectively, the “Funds”) have declared a special year–end distribution for each Fund's common shares as summarized below. The distributions are payable on January 16, 2015 to shareholders of record on December 29, 2014, with an ex–dividend date of December 24, 2014. In addition to the regular monthly dividend, this special year–end distribution is being paid to allow the Funds to meet their 2014 distribution requirements for federal excise tax purposes. The Funds' total distribution will be taxable to shareholders in 2014. WASHINGTON, DC—(Marketwired – Dec 19, 2014) – Visitors to the National Zoo are accustomed to seeing exotic animals. But this month, there's a whole other beast stealing the spotlight. Known as ZooLights, the free event features more than 500,000 twinkling lights, musical performances, food and shopping. And guests of the Washington Marriott Wardman Park are within walking distance of it all. There's a reason why ZooLights attracts thousands of visitors each holiday season. Actually, there are several reasons. In addition to the creative displays of environmentally–friendly, LED lights that depict everything from chimps to Christmas trees, guests will encounter trackless train rides, carousels outfitted with animal figurines in lieu of horses and Zoo–magination, where trains weave in and out of fantastical lands made of Legos, the alphabet and more. Plus the snowless, 150–foot “snow–tubing” tracks let visitors experience thrill of a bobsled ride, minus the chill. Guests who stay at this Washington, D.C. hotel near the National Zoo often do so because of the animals, and ZooLights doesn't disappoint on that count either. Nocturnal creatures are on display in the Great Ape House, Reptile Discovery Center and more. And visitors only have to walk a few steps north to see them all. Other entertainment includes live music every night and shopping at retail venues located throughout the park. And making sure guests stay fueled during their visits are concessions like hot chocolate, coffee, mulled cider, wine, beer, roasted nuts, s'mores and more. In addition to the hotel's unbeatable location near the National Zoo Metro Stop, the property offers exceptional amenities even among other Woodley Park hotels. The pet–friendly accommodations feature three diverse restaurants, a 24–hour fitness center and a variety of guest rooms that include Concierge Level options, more than 100 suites and ADA–accessible rooms. 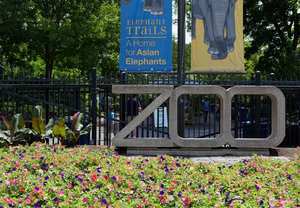 Plus the property is close to more than just the National Zoo. The stunning natural beauty of Rock Creek Park, the colorful and quirky Adams Morgan and the exciting nightlife of Dupont Circle are all just minutes away as well. Located in a leafy neighborhood of charming shops and restaurants, the Washington Marriott Wardman Park blends a genteel sensibility with expansive, state–of–the–art accommodations. Guests are treated to the same hospitality that has welcomed U.S. presidents and dignitaries with features like plush bedding, spa–like amenities, high–speed Internet access and flat–screen televisions in the more than 1,100 guest rooms and suites. Restaurants include Stone's Throw for steaks and seafood, Harry's Pub for English–inspired fare and Illy's Woodley Market for coffee and sandwiches. Unique among hotels in Washington, D.C. NW, the hotel offers an impressive 195,000 square feet of event space for productive conferences and spectacular social events. And the property's 16 acres of gardens make an inspired setting for both work and leisure. LINTHICUM, MD—(Marketwired – Dec 19, 2014) – With the holiday season upon us — the time to start planning travel has arrived, and the BWI Airport Marriott is offering a special package that appeals to both locals and out–of–towners. As a major airport, BWI takes guests across the country and around the world, requiring travelers to arrange transportation or pay for expensive airport parking. With this BWI airport hotel package, both are taken care of. The Park, Stay, Fly package offers overnight guests complimentary parking for up to 7 days, plus airport shuttle transportation, allowing travelers to leave their car in a safe, convenient location while they're away. Not only do guests enjoy a stress–free travel experience, but they also get to enjoy a good night's rest with an overnight stay at this hotel at BWI. Spacious guest rooms offer high–speed wireless Internet access, a coffee/tea maker, minifridge, plush bedding and cable TV. Before heading off to the airport the next morning, take a swim in the indoor pool or get in a quick workout in the fitness center. Those in a rush can grab a Starbucks® coffee at Day/Night Bar, while others with a little more time can sit down for a full breakfast at Chesapeake. To book the Park, Stay, Fly package at this hotel by downtown Baltimore, visit www.marriott.com/specials/mesOffer.mi?marrOfferId=802589&displayLink=true, or call 1–800–834–6704 in the US and ask for promotional code PKF. This offer is available through January 5, 2015, making it a great choice for summer and holiday travel. Just one mile from the Baltimore Washington International Airport (BWI), this hotel offers not only a convenient location to both Washington, DC and Baltimore, but attentive service and generous amenities to make being away from home as comfortable as possible. 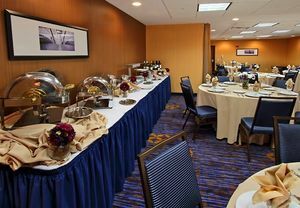 The airport hotel in Baltimore is popular with corporations and for celebrations, and offers 18,000 square feet of modern event space. 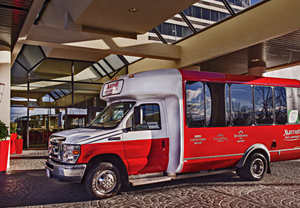 The Grand Ballroom can accommodate up to 1,200 guests, and a complimentary airport shuttle service makes it easy for out–of–towners to arrive on time and with little hassle. Guests can also entertain on a smaller level at the hotel's dining options, which include mouthwatering seafood at Chesapeake, Starbucks® coffee and free Wi–Fi at Day/Night Bar, and late–night comfort food and drinks at Champion Sports Bar & Restaurant. Guest rooms feature plenty of space and were designed with both productivity and personal time in mind. Working guests can stay focused with a desk and ergonomic chair, high–speed wireless Internet access and a coffee/tea maker; when it's time to unwind, order room service and catch popular shows on the cable TV. Suites are perfect for a special occasion or VIP guest, while concierge–level rooms come with upgraded services, lounge access and daily refreshments. Spend time relaxing at the heated indoor pool, whirlpool, fitness center and Olympic–size Ping–Pong table. Also, make time to explore the city's top attractions — Annapolis, the National Aquarium, Camden Yards, MarylandLive! and the Inner Harbor — which are all nearby and easily accessible via Baltimore Light Rail.